Heroin is the worst thing that has ever happened to me. Heroin is holding the person I used to be hostage. I used to laugh more. I used to be more light-hearted and whimsical. I used to smile in more than just pictures. I try to remember the moment my world began to revolve around it. It is mentioned in nearly every conversation I have, even when it’s not said outright, but in knowing glances, exasperated sighs or pity stares. Most of my hobbies have fallen by the wayside ever since heroin entered my life. I used to write about more than this. I used to read about more than this. I am a phony. My normalcy is a charade. Heroin forces me to keep secrets from the people who matter most in my life. I can’t tell my family how much pain I’m in because I can imagine the pain they are feeling too, and I don’t want to add to it. Like all families whose path it crosses, heroin has ruined some of the best parts of mine. We have fought with one another out of desperation, out of anger. We have said things we cannot take back. Heroin is the un-welcomed guest who has ruined holidays, birthdays and weddings. Heroin is the elephant in every room I inhabit. If I am there, so is heroin. It’s ever present. Heroin has taken sleep away from me. The days of a peaceful night’s slumber are far behind me. Heroin haunts me even when my eyes are closed. I go to sleep thinking about it; I wake up thinking about it. I wake up and think about heroin. I go to work and think about heroin. I talk on the phone and bring up heroin. When it’s really bad, I spend some days sick to my stomach, with very little strength and lacking the motivation to even get out of bed. Heroin has aged me. I look in the mirror, and I know I look tired, gaunt and disheveled. Heroin took my peace of mind and replaced it with a constant state of worry. I lost my innocence a long time ago — I admit, I miss the blissful ignorance that came with knowing nothing about this drug. The deeper I fall into this world, the more scared I become. I know this drug kills people, but I can’t stop its pull. It’s out of my hands. Heroin has taken so much from me over the years. Time I can never get back. People I will never see again. Memories I never had a chance to make. And the craziest part of all of this? I never touched the stuff myself. I have never used heroin, but I love someone who did. Addiction has such a large ripple effect, the collateral damage is immense, and what is hit the most and the hardest by heroin’s shrapnel is the family, the loved ones. Addiction is a “family disease.” This nightmare became my reality, I never asked for this, and that is what gets me so angry at times. I woke up, and my entire life changed. It may never be the same. The thing is, even though I am not addicted to drugs, I am suffering just as much, though in a different way because the family witnesses helplessly how one lapse in judgment, one wrong decision, one chemical dependency, can ruin everything. Yes, heroin has taken so much from me — but it hasn’t taken away my voice. It will not take away my voice. It is my hope to use my words to raise awareness about drug addiction and its direct effect on not only the user, but the user’s family. I started sharing my experiences, not to find answers, but to find momentary peace of mind. It was scary at first — but I am of the belief that one person’s story may change someone else’s and give a struggling individual or family member the strength to persevere through hard times. And you never know who needs to hear exactly what you are saying. So families, stay strong. Never give up hope. Alicia Cook is an established author and activist from New Jersey, where the rate of heroin overdose is three times the national average. Her work has appeared on the Huffington Post, CNN, USA Today, Teen Vogue, and many more. Her best-selling book of poetry, "Stuff I've Been Feeling Lately", was a finalist in the 2016 Goodreads Choice Awards (being traditionally published by Andrews McMeel Publishing in April, double the length of the self pub'd first edition) and her series, "The Other Side of Addiction", which focuses on the direct effect addiction has on not only users, but their families, is read by millions of people across the country. Her efforts to combat the heroin epidemic, which include writing, appearing on podcasts, and speaking to students and their parents, caught the attention of PBS Executive Producer, Steve Rogers who created an episode of his Emmy-nominated documentary series, “Here’s the Story” around Cook and her efforts entitled “A Family Disease.” The episode was dedicated to Cook's cousin, Jessica, who passed away from a drug overdose in 2006. In January of 2017, Cook was recognized for her writing on the topic of addiction and family at NJTV's "Everyday heroes" Event in Trenton, NJ. 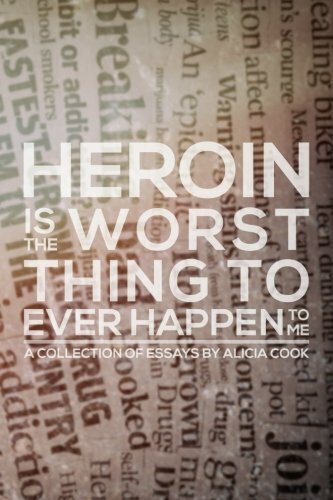 Her collection of essays, Heroin is the Worst Thing to Ever Happen to Me, debuted as the #1 Hot New Release and is in the top 10 overall on Amazon in the category of "Substance Abuse Recovery." The book is titled after Cook's most popular essay, which was read over one million times in under two months.